Emergency situations are about speed. That's why we made our 240 cm long aluminum probe even more efficient. Thanks to the optimized PFA system, the ALU 240 PFA is henceforth compact in pack size with better handling at the same time. The quick-release loop allows immediate opening and tightening with a handle. Emergency situations are about speed. That&apos;s why we made our 240 cm long aluminum probe even more efficient. Thanks to the optimized PFA system, the ALU 240 PFA is henceforth compact in pack size with better handling at the same time. The quick-release loop allows immediate opening and tightening with a handle. For the determination of the burial depth and an optimal adjustment of the bucket strategy, all our probes have legible depth markings and a clear 1-meter mark. The lowermost segment in neon orange gives a visual indication of the victim&apos;s proximity to shoveling. The new, improved textured grip of the ALU 240 PFA also ensures safe, icing-free handling in all conditions. That&apos;s it. With every detail. We develop highly specialized probes for different needs and user groups. The desire for precision and speed is our premise. Because that can save lives in an emergency. We deal with detailed solutions that make rescues even more intuitive and lead to a faster burial in conjunction with the avalanche transceiver and shovel. The successor to our often copied quick-clamping system has become schlanker with the same steplessly proven clamping performance and thus more pack-friendly. The new Quick Spanner Lock allows the probe to be stretched directly out of the case. Relaxation is by means of thumb pressure against the system cover. 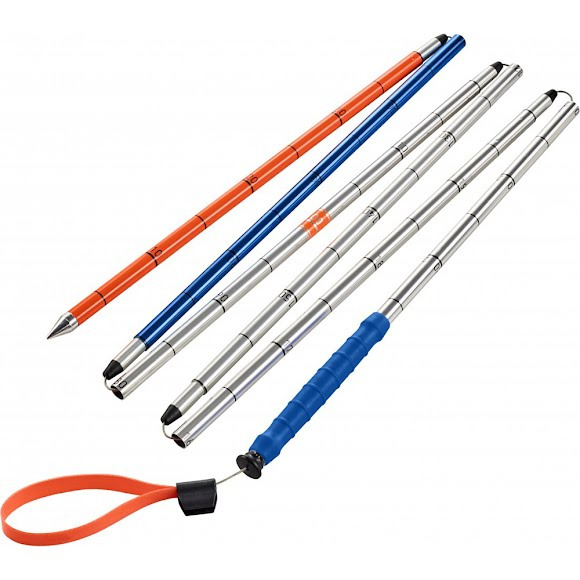 The thin and light rubber coating provides a perfect grip for quick tensioning of the probe. The intuitive visual guidance system gives you a quick and clear indication of the spillage depth at any time. Thanks to the unique 1 m mark, the contrasted deep scale and the colored end segments, you can optimize your shovel strategy and save valuable time. The lowest, neon-orange segment indicates when you approach the victim. Case The quick-release strap allows instant opening and tensioning with a handle without having to remove the probe from the case first. The significantly larger diameter than the probe elements promises better penetration.